Graphic designer and Brighton resident Irene Soler has spent the last 5 months leading her beach cleaning & data collection project ‘A Drop In The Ocean’, and has no plans to stop there! 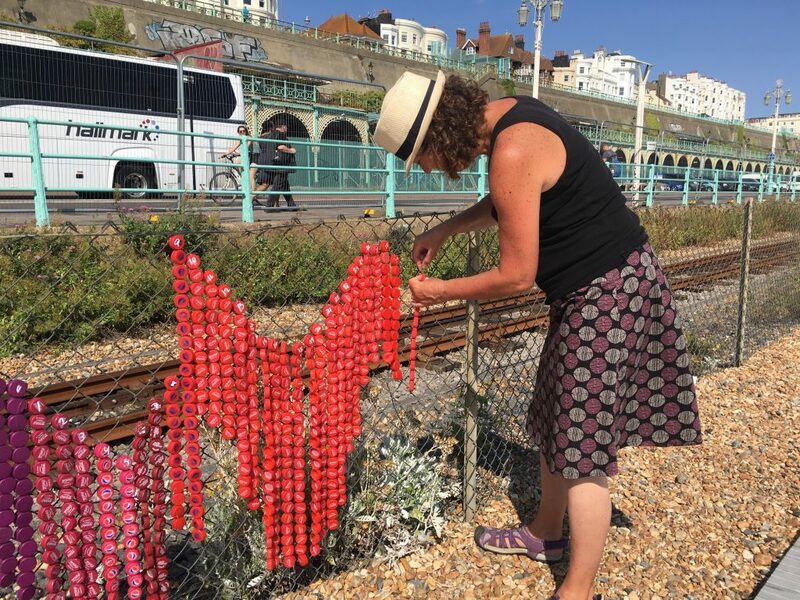 This ambitious conservation and design project is creating an infographic along the Volks Electric Railway, using bottle caps found along the Brighton seafront between March and October 2018. Irene has chosen to use multi-coloured bottle caps for her art installation as they not only take a long time to degrade, but are among the top 5 items found on beaches and aren’t widely recycled. Irene describes her art project as one in which she is, “Working with a number of people,” and has managed to collect over 9,000 bottle caps in only 3 months with the help of volunteers, along Brighton beach! In the future, she hopes to collect even more to raise awareness of the problem of beach waste. Bottle caps have been stringed together in shades and brands to make something beautiful from waste. When asked about her vision for the project, Irene says she, “Didn’t know what the design shape was going to be at first”. She added that “As a graphic designer, you normally have a lot of control.” but the approach to this design has been more responsive and changing. Once the installation has been completed, Irene hopes to use the bottle-caps collected to source useful data for both consumers and manufacturers. Both the quantity of bottle-caps collected and types of plastic found are just two data points Irene hopes to utilise later. Irene says she has already been contacted by manufacturers asking, “What is being done with our recyclable bottle caps?” – to which Irene responds, “Although it is helpful that something is being done on that end, recyclable bottle caps are still ending up on the beach”, so are in fact, not being recycled. This highlights the importance of the efforts being made by people like Irene to tackle the issue of plastic pollution. ← Plastic Free Shopping – With Glamour!